JoAnne Russell’s athletic resume bursts with big-time tennis achievements. She was Wimbledon doubles champ in 1977 and was ranked as high as No. 22 in the world in singles in 1983 and now teaches tennis at Grey Oaks Country Club in Naples. That’s not her only sport. Ms. Russell, 61, also plays pickleball. It’s no joke. As for how it got its name, theories abound, none of which can be substantiated. Regardless, it is proven that the sport has become immensely popular in recent years. 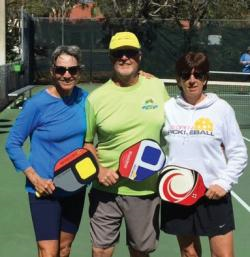 In fact, Collier County hosts two notable pickleball tournaments in the next several weeks. First is the Southern Tropics tournament taking place Friday through Sunday, Feb. 26-28, at East Naples Community Park. Even bigger, the U.S. Open Pickleball Championships take place April 26-May 1 at East Naples Community Park.